Is It Time to Restructure Your Chart of Accounts? The many benefits of using Analytical Dimensions to structure your Chart of Accounts within Sage Enterprise Management. When an enterprise is considering moving from an in-house system to an ERP, it's usually with a view to streamlining operational processes, typically in the areas of manufacturing or warehouse management. Integration with industry-specific solutions is often also high on the agenda, which usually means automating the resulting accounting entries with a view to speeding up the month end process. However, an implementation of Sage Enterprise Management, is precisely the right time to think about a restructure to a new accounting model. Through Analytical Dimensions in Sage Enterprise Management you are able to consolidate across different charts of accounts, even those in separate companies, which greatly enhances your reporting capabilities and visibility of data for your entire operation. Dimensions offer you a great way to enhance your reporting in a structured way, without having to extend your account codes and write complex SQL expressions or (worse still) freeform text on journals, invoices, etc. 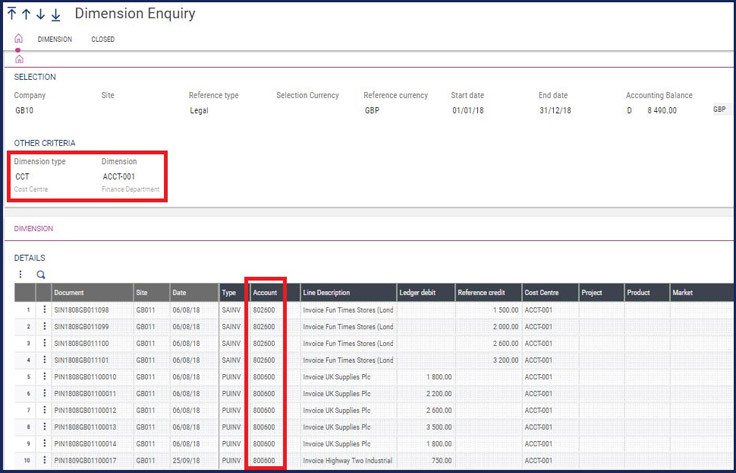 Dimensions are extra pieces of information that you attach to an entry, to enhance how that entry is analysed - that entry might be a journal, order, invoice or a budget value. Once you have that additional data then you can report on it using any of the many reporting tools available within Sage Enterprise Management. Post your phone bill to a general Department code and then use Enterprise Management to reapportion this at month end, based on a metric such as the split of total overheads by department for the month. In each of the above cases you could post to a single, simplified Telephone account, rather than have a separate account per department, and then view your posting either as a single line item or broken down by department. Then, you can take your Department dimension type and sort, filter and generally report on it, knowing that each department code is consistently defined. You can decide if dimensions are to be a mandatory input, apply default values and also link different dimensions to each other. For instance, you might have a user who's set up with a Department dimension for expenses processing. Then, whenever that user's expenses are posted, their Department dimension can be automatically filled in, as well perhaps as a corresponding Division or Cost Centre dimension linked to that department. Dimensions also are widely used to store financial budgets, with parameters available to define the level of controls against spend. Workflow emails can also be separately configured when a percentage of the budget is reached, to alert the appropriate budget holders accordingly. An increasingly typical use of dimensions in Sage Enterprise Management is in the area of Project Accounting, whereby a Project dimension can be used to store budgets and then actuals against different revenue and expense codes. You might also use the concept of Dimension Pyramids to group multiple projects under an umbrella code. The concept of Dimensions also comes into its own in a multi-company environment. Suppose you have a consistent department structure across multiple companies - dimension codes can be centrally maintained as a single list available to all companies, and that means that a Group Customer Services Director, would be able to monitor his departmental budgets and actuals across multiple entities, all in real time. Your current accounting model might be working well for you at the moment, but using Analytical Dimensions would allow you to simplify your chart of accounts, while far increasing the reporting power at your disposal moving forward.